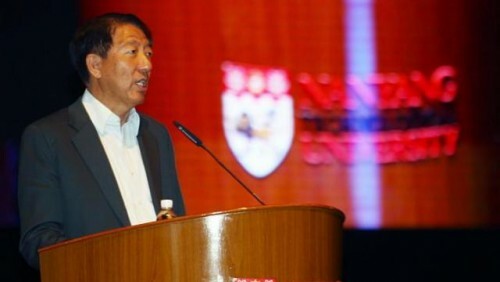 SINGAPORE - Science and technology has shaped Singapore's development in the past and will continue to be the foundation for the country's future, said Deputy Prime Minister Teo Chee Hean on Sunday. Speaking at the opening ceremony of the third Global Young Scientists Summit at Nanyang Technological University, Mr Teo said: "In recent years, the Singapore Government has placed even stronger emphasis on research and development (R&D), innovation and enterprise." "In a concerted effort, we established public-sector research and development centres, invested in developing research manpower, and encouraged companies to conduct R&D in Singapore." Mr Teo said that research and development efforts here were beginning to bear fruit, citing as examples graphene research at the National University of Singapore, which can be used to develop advanced two-dimensional materials, and the Singapore Spintronics Consortium, which explores electron spin-based technologies for sensor, memory and logic applications. "We are strengthening our collaborations with scientists around the world, and contributing to international efforts to address global problems," went on Mr Teo. "We hope that the solutions we develop will have relevance in other countries, as they face population, urbanisation, healthcare and ageing pressures." At the annual international summit, 300 young scientists from 70 universities and research institutions worldwide will get to interact with eminent scientists, including 12 Nobel Laureates and the winners of other prestigious awards such as the Fields award for mathematics and the Turing award for computing. Participants can also present their own research ideas as part of the Singapore Challenge to address the issue of ageing populations. Mr Teo said: "We are developing a research programme to improve quality of life for an ageing population." He added that the summit "plays a useful role to strengthen the linkages among scientists across borders, across disciplines, and across generations." Prior to the ceremony, Mr Teo had received a courtesy call from Her Royal Highness Princess Maha Chakri Sirindhorn of Thailand. Among the first-time participants at the summit was Ms Wang Kejia, 23, who is doing a PhD in biomedical engineering from the University of New South Wales. "I feel really lucky to be here at this very prestigious and well-connected event," she said. "I hope to get advice from the speakers on my own career in science." Mr Henry Koh, 33, who researches advanced materials technology at the DSO National Laboratories here, said he was particularly looking forward to the panel discussions with researchers from other countries on how to balance creative risk-taking in research with potential economic value. "When you get different researchers from different cultures thinking about how to treat the same problem, you get the chance to increase your perspective in a way you wouldn't have if you hadn't met them," he said. The summit will run from today till Friday (Jan 23).